It's time for a status update on our new migratory bird habitat, and a big thank you to everyone whose donations are making it possible! The new habitat is needed because in the wild, our sandhill cranes and turkey vultures would be spending their winters in Mexico. Since all of them are non-releasable, they are stuck here in Montana for a much harsher winter than they are equipped for. To deal with this, we've been keeping them indoors in the winter, in a heated barn. This isn't the best solution, because it keeps them off display, and they can't enjoy any sunny days that we get during the winter. Our solution: a new habitat! We broke ground a few weeks ago on a new structure that will provide heated indoor areas for the cranes and vultures, along with adjoining outdoor yards that they can move in and out of, similar to what they have now. 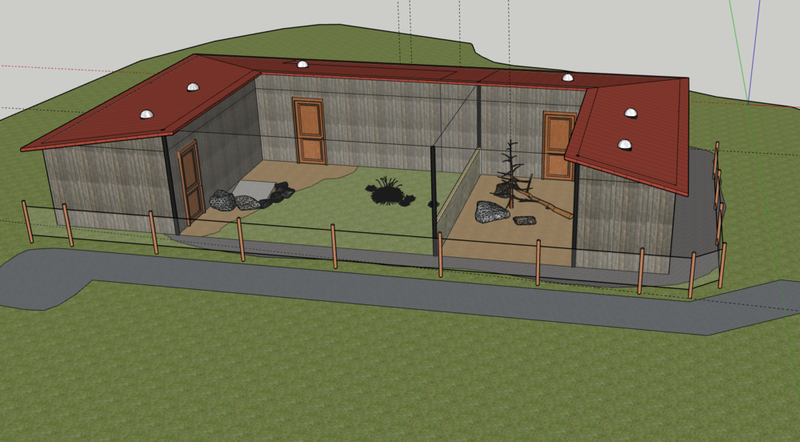 This structure will allow us to open their outside door on sunny winter days, allowing the birds to move between the outdoor yard and the heated indoor areas as they please. The foundation went in a couple of weeks ago. This picture is taken from the back corner near the keeper's entrance to the crane's heated indoor area. The open area in the center of the "U" is the outdoor yards for the birds. Our contractor Armando is putting the walls up now. The wall that shows in this picture is the side wall of the vulture's heated indoor area, and Armando is standing in what will be the "behind the scenes" keeper area. If you look up at the the top of the hill in the background in this picture, you see our animal care staff working on our other big project: the new wolf habitat. Here's an artist's rendering of the finished habitat. We made a number of changes and improvements since this drawing was made, but it shows the key points. The area on the left is for the cranes, and will include a pool and waterfall in the back left corner. The area on the right is for the vultures, and will include plenty of perches for them at different heights.